Economics for the Common Good. We're proud of our history and our roots as Christians on the Left. It's likely that an elderly RH Tawney attended some of our founding meetings as the Christian Socialist Movement, and we have certainly been influenced by his writings. Hence our annual memorial event "The Tawney Dialogue". 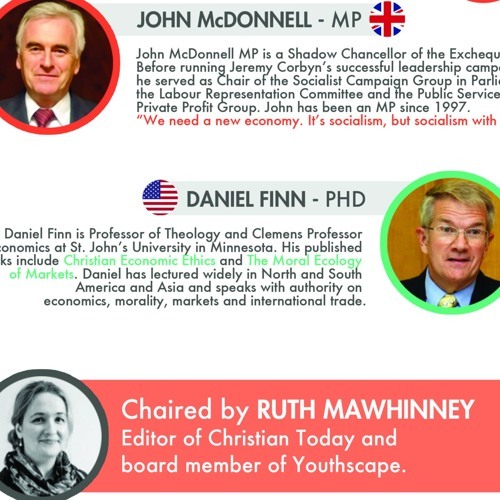 This year we will be hearing from John McDonnell MP, Shadow Chancellor of the Exchequer and Daniel K Finn PhD, University Lecturer and Professor of Theology & Economics. This year’s promises to be a fascinating event as every year, prompting debate, discussion and action. Perhaps even a little controversy! John McDonnell MP John McDonnell MP is Shadow Chancellor of the Exchequer. Before running Jeremy Corbyn’s successful leadership campaign, he served as Chair of the Socialist Campaign Group in Parliament, the Labour Representation Committee and the Public Services Not Private Profit Group. A leading member of a number of all-party groups within Parliament, including groups representing individual trade unions, McDonnell, alongside Jeremy Corbyn has been seen as a key proponent of democratic socialism within the Labour Party. John has been an MP since 1997. “We need a new economy. It's socialism, but socialism with an iPad”. Daniel K Finn Ph.D Daniel Finn is Professor of Theology and Clemens Professor of Economics at St. John’s University in Minnesota. He is an international speaker, writer and researcher and lectures in ethics and economics, morality, markets and international trade. Finn has written many prominent books including "The Moral Ecology of Markets" and "Christian Economic Ethics". In 2008 he was recipient of the Monica Hellwig Award for outstanding contributions to Catholic intellectual life and in 2009 he was President of the Society of Christian Ethics. Chair - Ruth Mawhinney Ruth is Editor of Christian Today. Ruth has ten years of experience in Christian media, most recently editing Christianity magazine, which she did for four years prior to joining Christian Today. She is also on the board of Youthscape, an innovative youthwork charity. Users who like The Tawney Dialogue 2016 - "Economics for the Common Good"
Users who reposted The Tawney Dialogue 2016 - "Economics for the Common Good"